Sonic Quest 2 is the second issue of the Sonic the Hedgehog comic series Sonic Quest miniseries, the second of three parts. It was released in January 1997. It takes place after the events of issue 041, detailing the adventures of the new Death Egg saga and the aftermath of retrieving Maximillian Acorn from the Zone of Silence. Continued from Sonic Quest 1. The events from the previous issue are told. King Maximillian Acorn has been rescued from the Zone of Silence, but upon returning, his mind became scrambled and his body started to undergo an unknown crystallization process. The only glimmer of hope for the King was a brief reaction to Sonic's billionth ring. Upon seeing this, Sally Acorn broke the Freedom Fighters into two groups to retrieve more rings. Sonic and Tails didn't fare well, as Tails was scooped up by a vacuum tube reaching to the sky, and Sonic was knocked out and taken by a roboticized Freedom Fighter named Condor. Snively, now in control of Robotropolis while Dr. Robotnik controls the Death Egg, is having Robotnik's bots pamper him, rather than rebuilding the city. He lays on a bed while two bots massage him, and a floating table holds a beverage. He looks over as Robotnik calls from the Death Egg: his ultimate creation that, once completed, will be able to roboticize the whole planet. Snively panics, knocking the beverage aside and getting up, not wanting Robotnik to see him disobeying his orders. Not noticing Snively's incompetence, he continues detailing his plans with the Death Egg. Having removed the rings from the grotto outside the city, he aligned them in a chain-link on the outside of the Death Egg, rendering it invulnerable to any attack. He only requires one more thing to bring the station to full power: a Chaos Emerald. Snively looks at the console readings in front of him, noticing that the Death Egg is at a lower altitude than normal. Robotnik notes that the SWATbot operating the grotto vacuum had sucked in numerous debris, increasing the weight of the station. Once he determines there are no more rings in the debris, he will jettison it. Once he has attained normal altitude, he'll commence a search for a Chaos Emerald to begin the roboticization efforts. Inside the excess garbage compartment of the Death Egg, Tails works his way out of all the debris and the landscape vacuumed from the grotto. He suspects its Robotnik's doing, confirming it as he sees a broken SWATbot beside him, the same one that Robotnik disposed after he vacuumed all the debris. He grabs the SWATbot and works himself into it, using it as a disguise to see what Robotnik is up to. Right as he puts on the helmet, a SWATbot enters the room, scanning the debris for extra rings. Not wanting to get disposed, Tails exits the room quietly, as the SWATbot completes a second scan of the room, confirming his findings. Outside the room, Tails prematurely hits the 'dump' button on a nearby console, trapping the SWATbot in the room as it is purged. Once the debris is purged, Robotnik calls to a disguised Tails, asking him to come to the bridge of the station to help him. Tails salutes, proud that his plan is working. Meanwhile, outside the Death Egg, the roboticized Condor, with an unconscious Sonic in its talons, approaches the station to bring Sonic to Robotnik. Unknown to Condor, Sonic is playing possum. He opens his eyes and enters a spindash, freeing him from the talons. Using his Super Peel-Out, he is able to stay aloft, punching Condor in the face. Despite this hit, the Condor recovers quickly, hitting Sonic with its wings. Going in for the final hit, Condor swoops down toward Sonic, not realizing that the dumped debris is falling right over it. Sonic looks up, noticing the debris. He throws himself at Condor, allowing him to propel up to the debris. Using the debris and his honed jumping skills, he hops between all the debris in the pile, allowing him to reach the Death Egg's garbage doors, while Condor is hit and sent down by the debris. The doors start to close, as Sonic rests for a minute, taking out his communicator to update Sally. Something jams the communicator, making him realize that he is alone in his mission. Back in Knothole Village, Sally remains at King Acorn's bedside, asking NICOLE if it can give any details about what is going on with him. Despite its state-of-the-art technology, NICOLE can't determine anything about the crystallization of the King, other than that he is 65% crystallized. Rotor and Geoffrey return to the hut, updating Sally on the progress on retrieving the rings. Bunnie Rabbot and Antoine have yet to reach the Lake of Rings, as Antoine got them lost, forcing Bunnie to fix their route, while Sonic and Tails have yet to update on their progress. All the stress gets to Sally, as she throws herself into Rotor's arms, crying, thinking that everything they've worked for is falling apart. As Rotor comforts her, a tear comes out of one of the King's eyes. 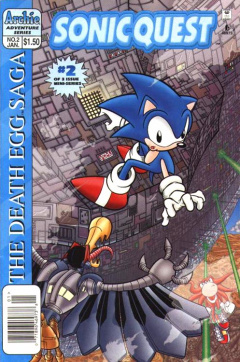 Onboard the Death Egg, Tails has arrived on the small bridge, as Robotnik begins the process of locating a Chaos Emerald. He pushes a few levers, propelling the station to full speed, as Tails tries to get a look at where Robotnik is heading. He is shocked, as he sees the Floating Island appear out the window. On the Floating Island itself, the arrival of the Death Egg does not go unnoticed, as Knuckles the Echidna sees it approaching from behind a cloud. Using a jet of steam, he glides up to the station to stop it, realizing it is a lot bigger than he had expected. Before he can get close to it, one of the eyes of the Death Egg unleashes a strong laser pulse, stopping Knuckles and sending him falling back to the island. He doesn't hit the ground, as he is saved by Mighty, with the other Chaotix, including Archimedes, as well. Robotnik unleashes two large Burrobots onto the island, sending them off into different directions to find one of the island's two Chaos Emeralds. He orders them to find the Chaos Emeralds, no matter the cost, making Tails realize that he must come up with another plan to stop Robotnik. Archimedes instantly determines the mission of the Burrobots; to find the island's two Chaos Emeralds. Realizing he is right, Knuckles tells the Chaotix about the Burrobot's plans, and how they could destroy the island. They split up, rushing out to stop the Burrobots before they can locate the Emeralds. Knuckles, Archimedes, Mighty and Charmy Bee take on one Burrobot, while Vector and Espio target the other. The first group easily take care of the Burrobot: Archimedes melting one of its drills, Mighty destroying its head with a log, Charmy throwing rocks at it, and Knuckles punching it. Espio gets the other into a choke hold, while Vector damages it with a sharp log. Back on the Death Egg, Sonic works his way up the many levels of the station, destroying all SWATbots that are in his path. He arrives at the control room, slowly peering from the edge of the door to see what Robotnik is up to. Robotnik is so angry about the Chaotix destroying his Burrobots that he prepares to destroy the island, not realizing that Tails is about to leave the room. However, Sonic sees Tails exiting the room, and prepares to take him out. Meanwhile, Robotnik sets a collision course with the island. The Chaotix panic and run away, as Robotnik crashes the station deep into one of the Floating Island's tallest mountains. As revenge for destroying his Burrobots, he reroutes all power to the station thrusters to push the island into the sea. Despite the immense weight and power of the station, the Chaos Emerald keeping the island afloat is able to barely counteract the station. As Robotnik pushes the station's thrusters further to beat the Chaos Emerald, going beyond the limits of the station's systems, many alarms start to go off. His efforts work, as the island starts to dip toward the sea, so he prepares a booster surge to increase power. Knuckles and Mighty contemplate what is going on, as Robotnik is focusing his effort on the south end of the island, while the Chaos Emerald must distribute its power evenly around the island to keep it equally afloat. Despite this, Archimedes believes that nobody can beat the power of a Chaos Emerald, and that Robotnik can't win. Nonetheless, Robotnik's efforts cause the island to go off balance, forcing the Chaotix to start to fall. They grab onto objects to avoid falling off, while Knuckles glides away to face the station again. As he leaves the island to assess the situation, Knuckles is shocked to see that Robotnik's efforts are working, as part of the lower section of the island has started to become submerged in the sea. As guardian of the island, and to the hundreds that live on it, Knuckles intends on finding a way to stop the Death Egg, even if he dies while doing so. Continued in Sonic Quest 3. The second Chaos Emerald on the Floating Island was acquired by Knuckles in Super Sonic vs Hyper Knuckles. Dr. Robotnik crashing the Death Egg into the Floating Island refers to the events of the Death Egg crashing into the island in Sonic 3, including submerging the lower part of it. This page was last edited on 1 February 2014, at 21:05.